On December 6 members of the p4ges team represented the project and shared research results at FLARE. An international meeting focused on the relationship between forests and livelihoods in terms of how forests are defined, accessed, used, governed, and protected, and how humans and societies can improve both conservation and economic outcomes. Projects from around the world were presented by a diverse participant base capturing a wealth of different scientific realms and backgrounds including environmental, social, and biophysical expertise. Karyn Tabor, Jenny Hewson, James Mackinnon, Mahesh Poudyal, Sarobidy Rakotnarivo and Patrick Rafidimantsoa all presented pp4ges research. Karyn presented results evaluating the conservation effectiveness of investments, in terms of effects on both deforestation and fire, made in CAZ over the last eight years. 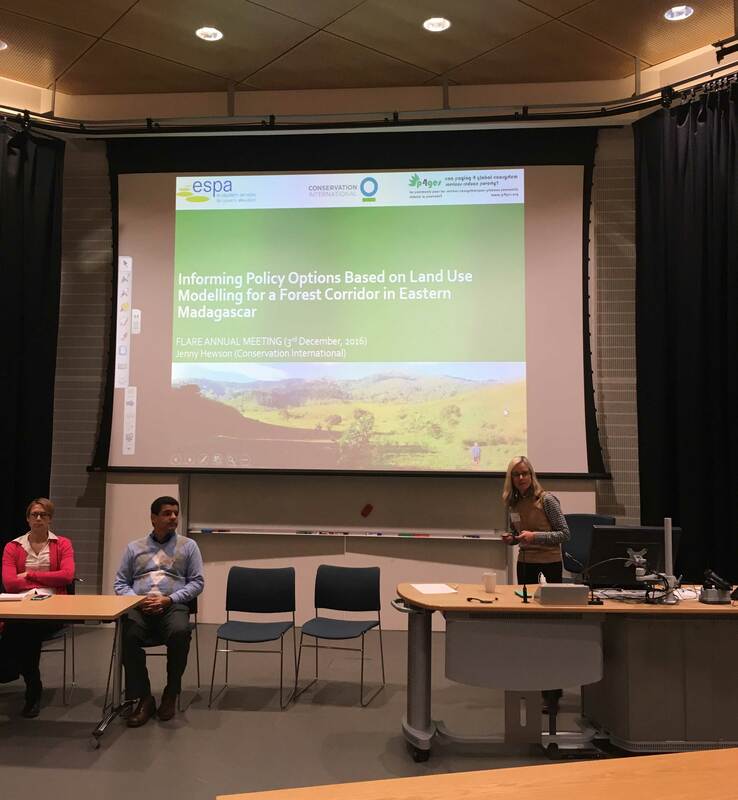 Jenny presented results from a set of potential deforestation scenarios generated to help inform effective policy development for the CAZ. James presented results from a study to assess whether small scale livelihood projects deliver both livelihood and forest conservation outcomes. Mahesh asked the question ‘who bears the costs of forest conservation?’. Sarobidy presented evidence that property right (or perceived property rights) affects how choice experiments should be designed to estimate opportunity costs of conservation. Patrick presented on barriers for research results being used to improve forest management in Madagascar.